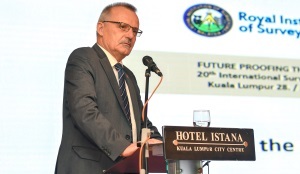 FIG Vice President Rudolf Staiger was invited to give a keynote speech at the 20th International Surveyors’ Congress in Kuala Lumpur. Malaysia. 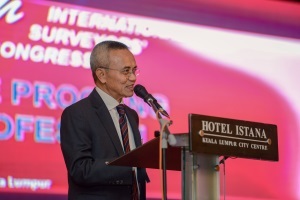 The Royal Institute of Surveyors Malaysia (RISM) and the Association of Authorized Land Surveyors Malaysia (PEJUTA) organized the 20th International Surveyors’ Congress at Istana –Hotel in Malaysia’s capital Kuala Lumpur on 29th and 30th of June 2018. The Congress was officiated by Madame Ybgh. Tan Sri Rafidah Aziz the current chairperson of Air Asia X Berhad. Previously she has been member of Parliament from 1982-2013 and Minister of International Trade and Industry from 1987-2008. She gave a very interesting and encouraging opening speech with direct references to the theme of the Conference: “Future Proof of the profession”. RSIM is representing four different branches within our profession: Building Surveying (BS), Geomatic & Land Surveying (GLS), Quantity Surveying (QS) and Property Surveying (PS). Rudolf was invited to speak in a key note with the title “the status of the profession” to more than 500 attendees of the Congress. After a short review of the different technical phases of the surveyors measurement technologies he focussed on Big Data, which is one of the current and future challenges within our profession. At the end of the Congress Sr Hj. Mohhammad Azmi bin Mohd Zin, the FIG Co-Congress Director 2014, was elected as new RISM President for the term 2018-2019.